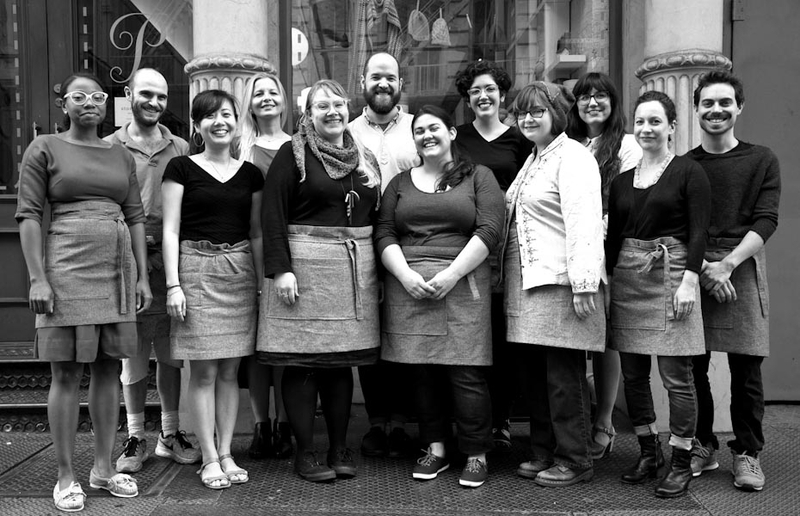 Purl Soho’s retail team juggles many roles: color theorist, sweater surgeon, sympathetic listener, teacher, and pupil. For a staff this adept, we made a Shop Apron that is just as versatile! 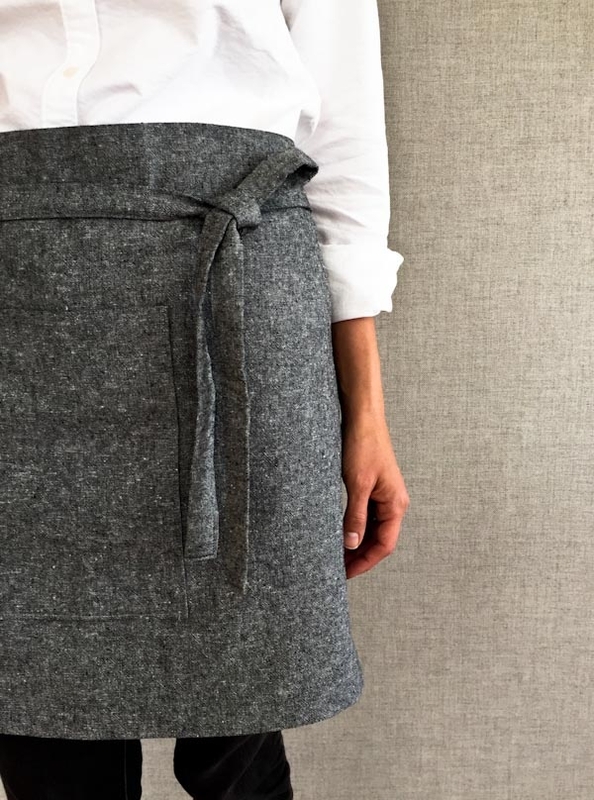 Designed to fit at the waist or hip and in multiple sizes, our Shop Apron is the perfect shop assistant. Long, sturdy ties and a flattering fit make it easy to wear, and roomy pockets with a clever double-lined construction hold the tools of the creative trade. 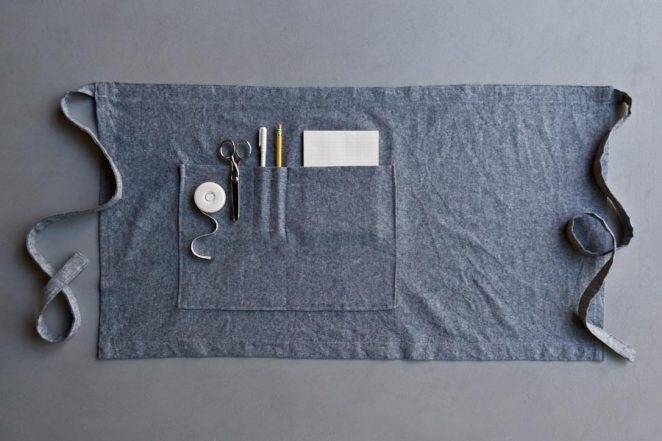 Our staff keeps handy a pen and paper to sketch out impromptu quilt designs, a calculator to add up yarn yardages, a small crochet hook to catch pesky dropped stitches, plus a measuring tape, small scissors, and pretty much everything else the job requires. 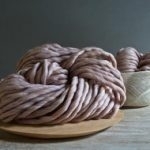 1 1/4 yard of Robert Kaufman’s Yarn Dyed Essex. We used the colors Black, Charcoal and Indigo. 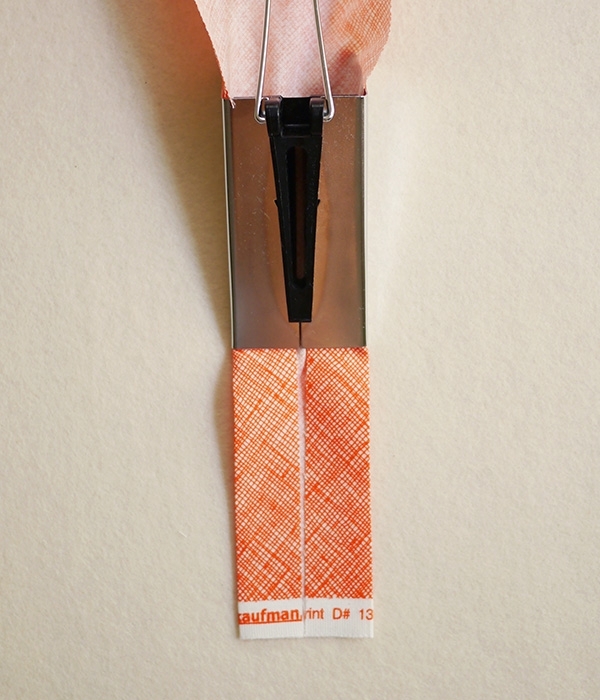 A fabric-marking tool. I used Clover’s Chaco Pen with Eraser, Blue Water Soluble. 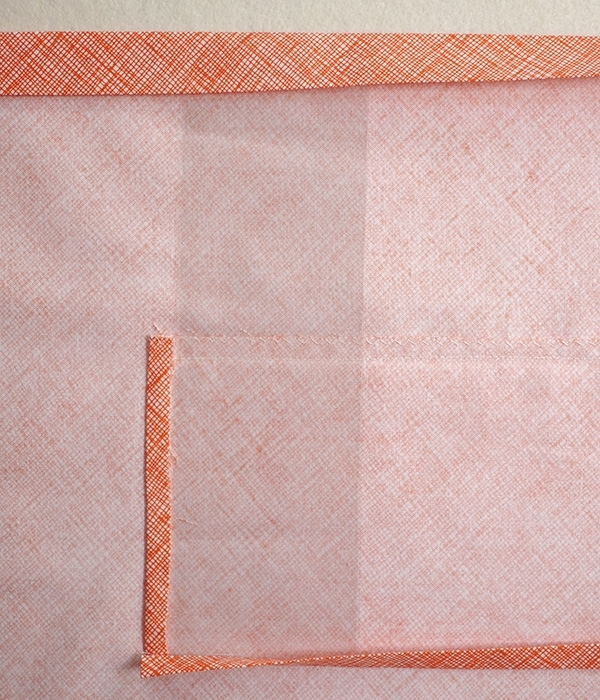 Prewash, dry, and iron the fabric before starting. NOTE: When cutting simple rectangular shapes for patterns such as this, straight, clean cuts are key. The best way to make these cuts is with a rotary cutter and a non-slip quilting ruler on a self-healing cutting mat. If you have limited experience using a rotary cutter, I recommend visiting our Rotary Cutting Tutorial! One 36 x 23 (39 x 23 ½, 42 x 24, 45 x 24 ½)–inch rectangle. This is the Apron Body. One 16 ½ x 12 ½-inch rectangle. This is the Outer Pocket. One 8 x 6-inch rectangle. This is the Inner Pocket. Two 33 x 3 7/8 (36 x 3 7/8, 40 x 3 7/8, 43 x 3 7/8)– inch rectangles. These are the Ties. One 2 ¾ x 9- inch rectangle. 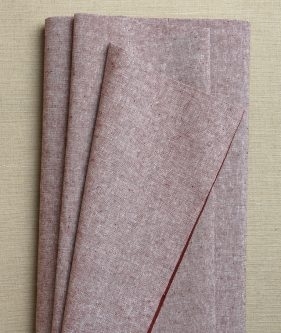 This is the Pocket Lining. Fold one Tie in half lengthwise and press to create a crease. Open up the fold. 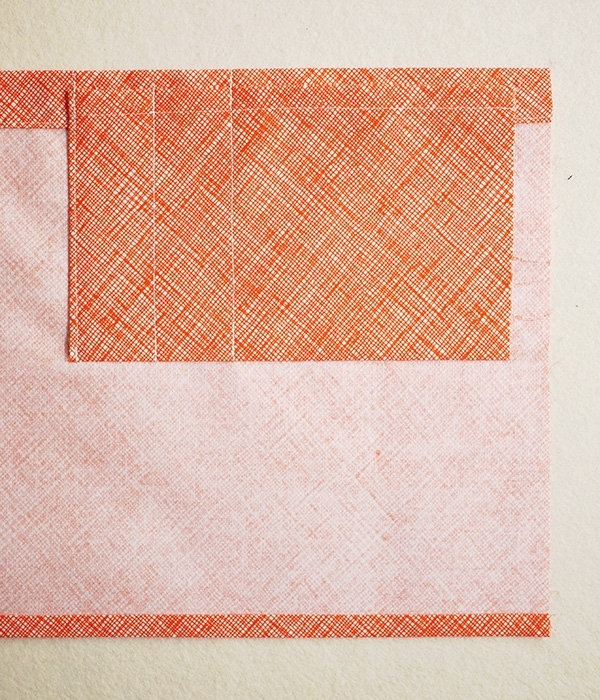 Now, fold in the two long, raw edges to meet the center crease and press. 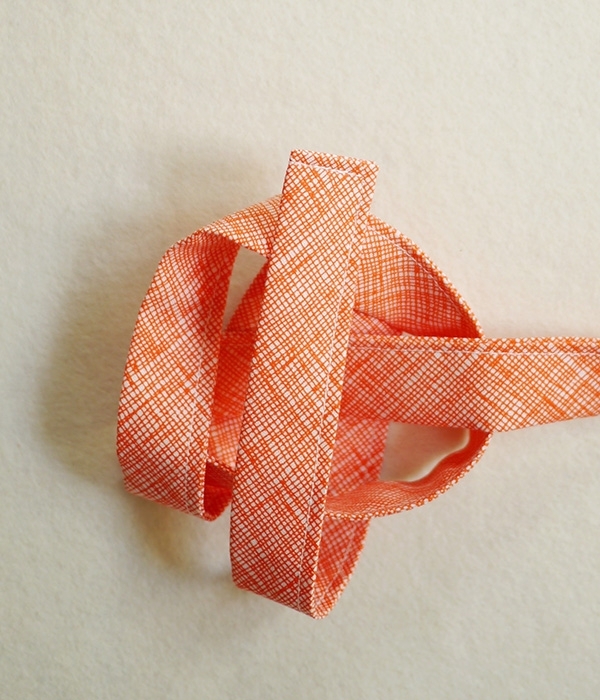 Alternatively, you can create these folds using a 50 mm bias tape maker. 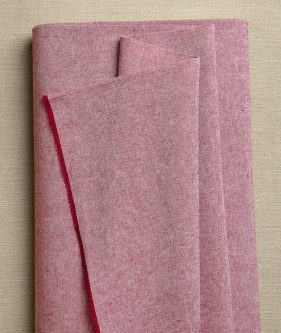 Fold the Tie in half lengthwise so that the raw edges are encased in the fold and press. 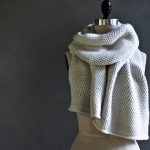 Open up the folds at one short end of the Tie. 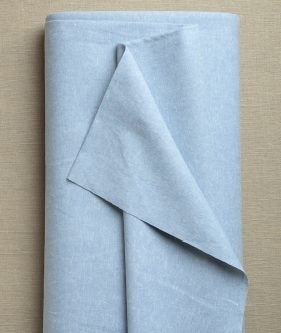 Fold the short edge ¼ inch in towards the wrong side of the fabric and press. Refold the creases of the Tie. 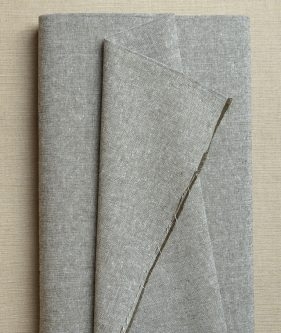 Sew along the open folded edges of the Tie with an edgestitch, backstitching at the beginning and end of the seam. Repeat with the other Tie. 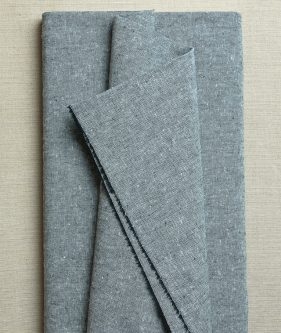 Fold one short side of the Apron Body ¼ inch towards the wrong side twice. press and pin. 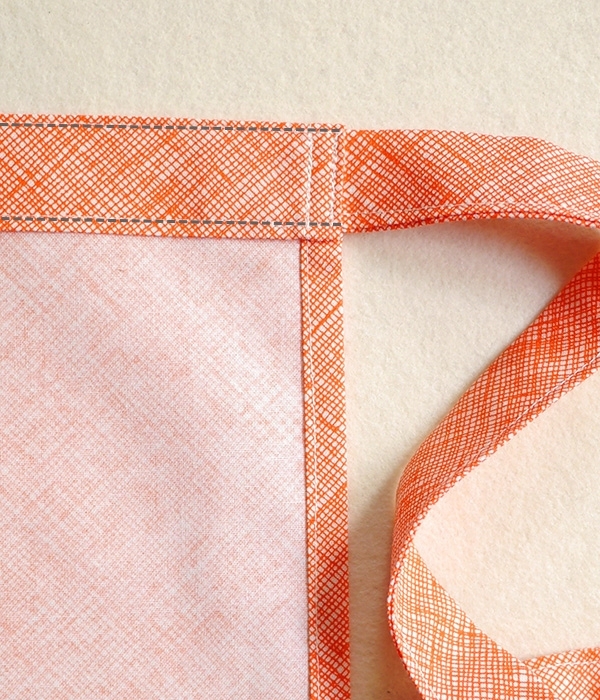 Sew along the pinned edge with an edgestitch. Repeat on the other short side. Now, fold one long side of the Apron body 1 inch towards the wrong side twice, press and pin. 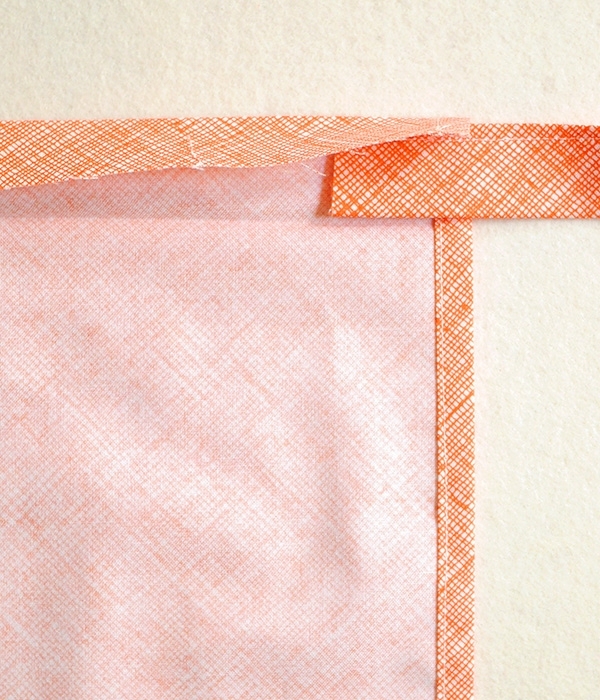 Sew along the pinned edge with an edgestitch, backstitching at the beginning and end of the seam. This is the Bottom Hem of the Apron. Fold the other long side of the Apron Body 1 inch towards the wrong side twice. Press, but do not sew this hem. This is the Top Hem of the Apron Body. Open up the fold of the Top Hem on one side edge. 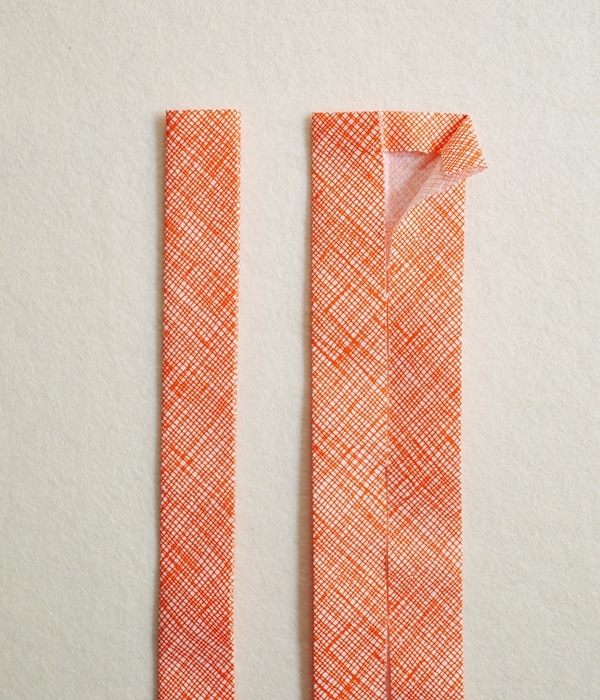 Lay the short raw edge of one Tie in between the lines of the folds. The raw edge of the Tie should be about 1 inch from the Apron Body’s side edge, and the long sewn edge of the Tie should run along the Top Hem. Refold the creases of the Top Hem, keeping the Tie inserted in the folds. Sew the Tie in place with two 1-inch long seams. Sew the first seam on top of the Apron Body’s side hem, catching the Tie and all layers of the Top Hem in the seam. Backstitch over the length of this seam, and then sew forward again. Sew the second seam 1/8 inch from the Apron Body’s side edge. Sew over this seam 3 times, as described for the first seam line. Repeat with the remaining Tie on the other side of the Apron’s Top Hem. Edgestitch along the top and bottom folds of the Top Hem, backstitching at the beginning and end of the seams. 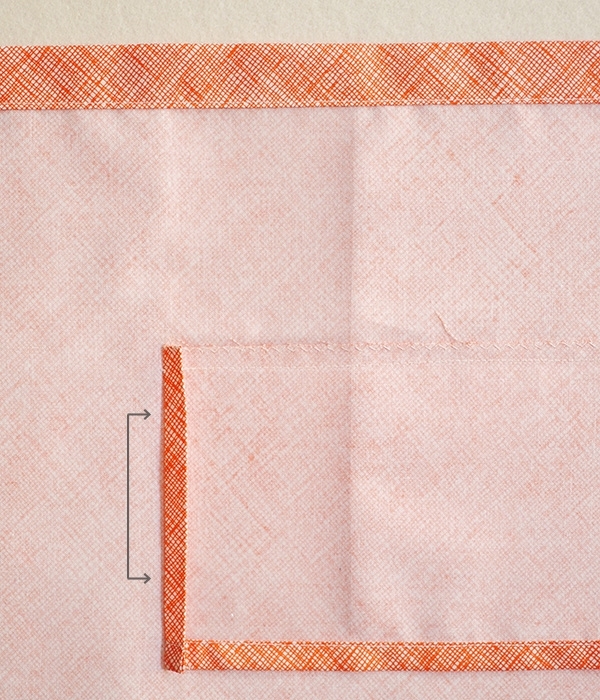 Sew along one long edge of the Inner Pocket with a zigzag stitch. This is now the Bottom Edge. 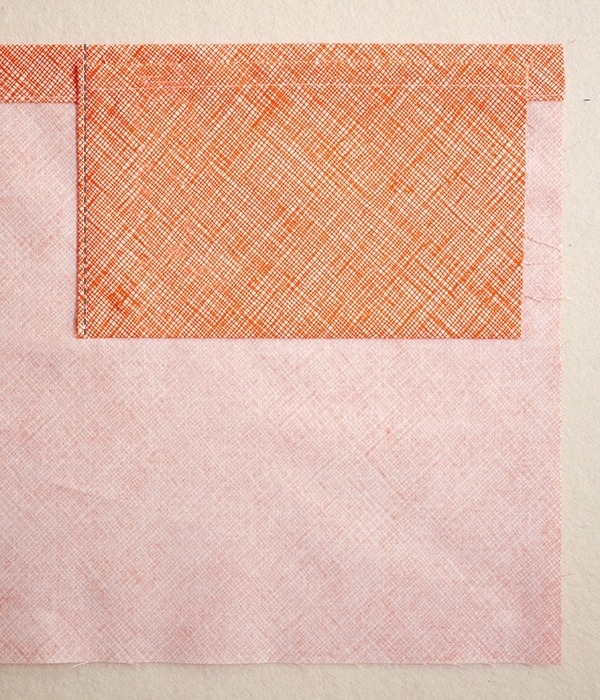 Lay the Inner Pocket out flat with the wrong side facing up and the Bottom Edge at the bottom. 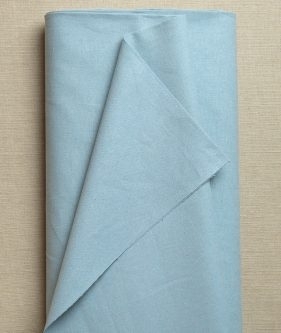 Fold the short right hand edge ¼ inch towards the wrong side and press. 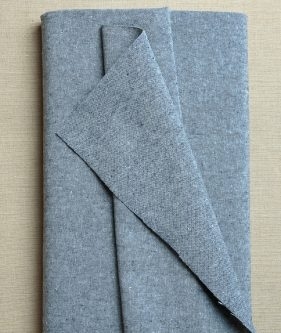 Now, lay the Outer Pocket out flat with its wrong side facing up and its two long sides running along the top and bottom. 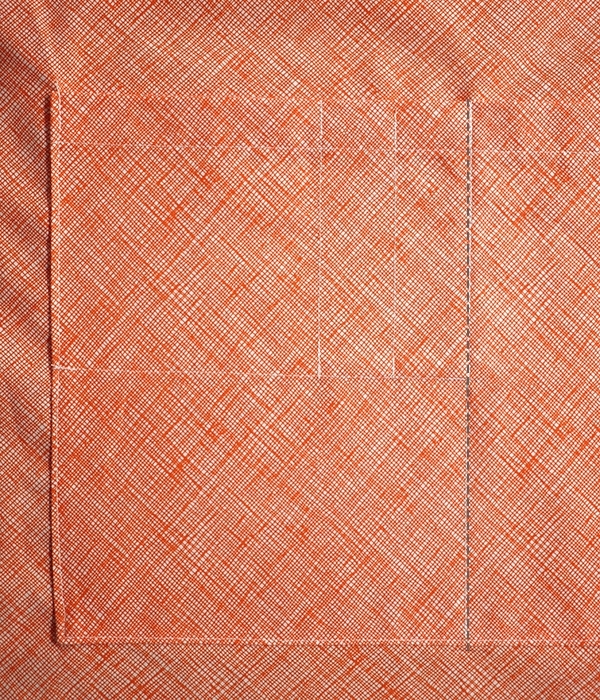 With its wrong side facing up, lay the Inner Pocket upside down on the bottom right corner of the Outer Pocket. 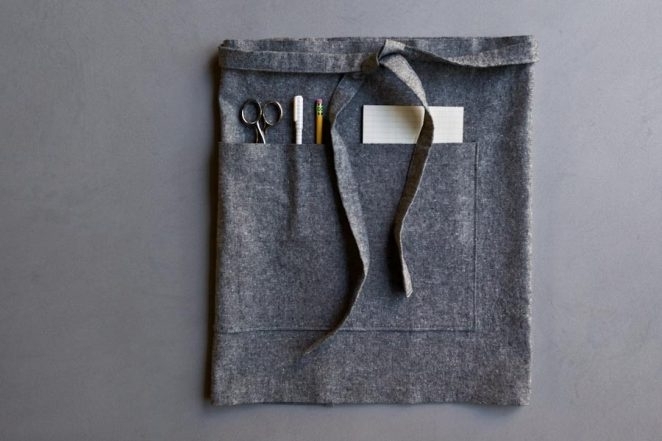 Arrange the Inner Pocket so that its long raw edge lines up with the bottom edge of the Outer Pocket and its short raw edge runs parallel to and ½ inch from the right edge of the Outer Pocket. Pin the two Pocket pieces together along the Bottom Edge of the Inner Pocket. 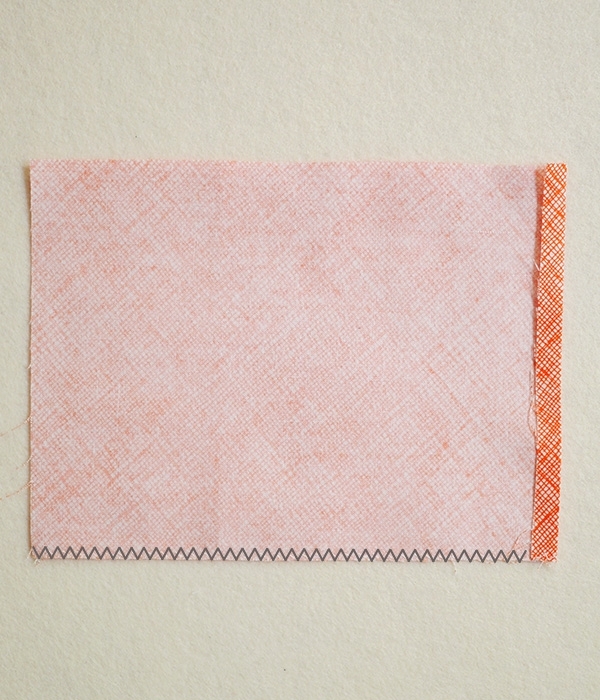 Sew along the pinned edge, ¼ inch in from the zigzag. Do not sew past the fold of the Inner Pocket. 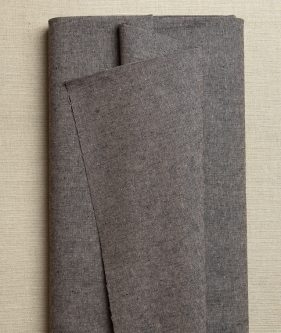 With the two Pockets lying wrong side up and the Inner Pocket at the lower right corner of the Outer Pocket, fold the long, raw edge of the Inner Pocket ¼ inch towards the wrong side twice and press. 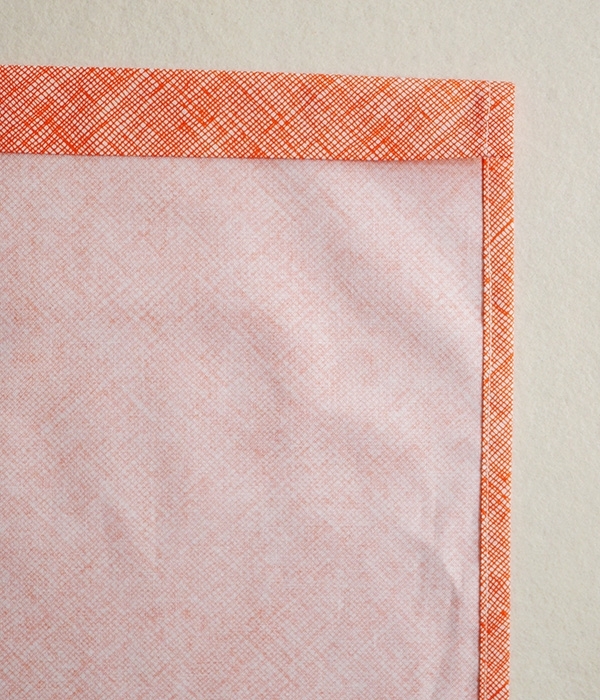 This is the Inner Pocket Top Hem (although it may feel like a bottom hem at this point!). 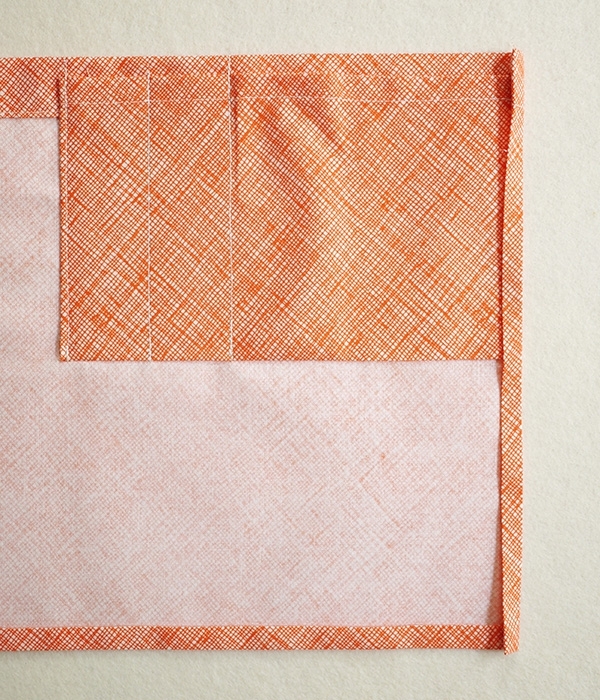 Now, fold the top raw edge of the Outer Pocket 1 inch towards the wrong side twice and press. This is the Outer Pocket Top Hem. 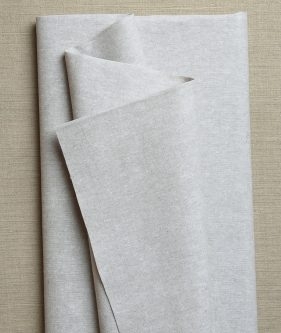 Peel the paper off of the vinyl Pocket Lining. With its sticky side down, lay the vinyl on top of the Pockets so that one long side runs next to the Inner Pocket’s folded side edge and each of vinyl’s short sides are tucked under a Top Hem fold. 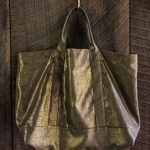 Iron the vinyl to the fabric, following the manufacturer’s instructions. 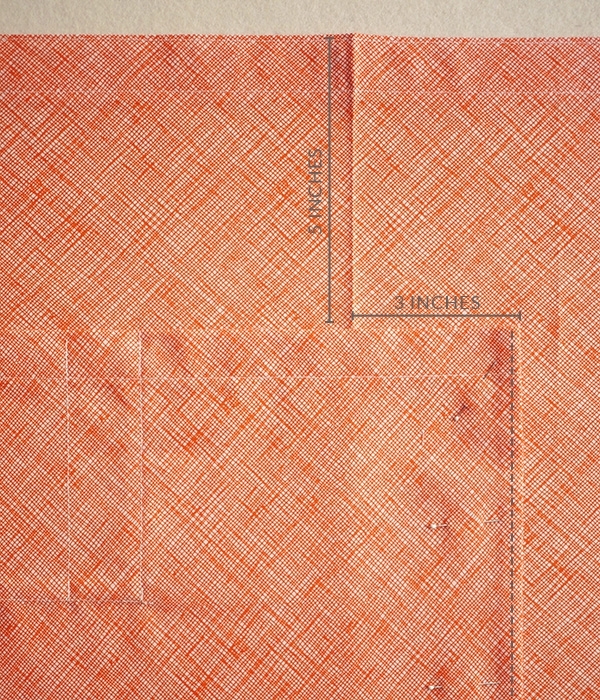 Sew down the folds of both Top Hems with an edgestitch. Fold the side fold of the Inner Pocket another ¼ inch towards the wrong side and press. 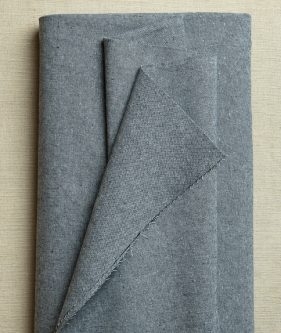 Fold the Inner Pocket up along its seam line, so that the wrong sides of the two Pocket pieces are facing each other. 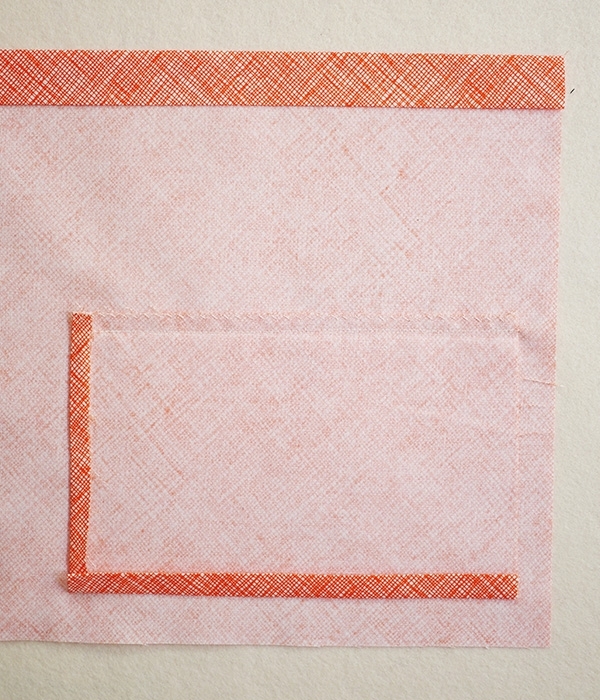 Pin the Inner Pocket to the Outer Pocket along the folded side edge of the Inner Pocket and sew with an edgestitch. Backstitch at the beginning and end of the seam. 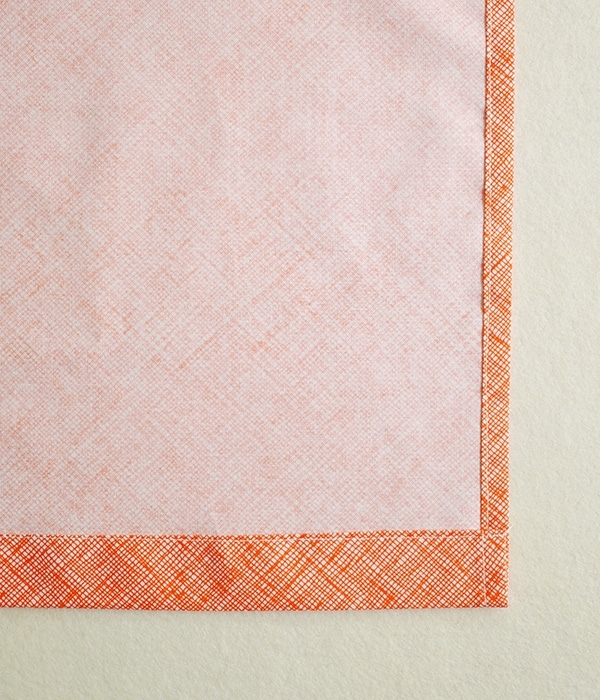 Use a fabric marker and a straight edge to draw a line 1 ¼ inch to the right of and parallel to this seam, running from the top edge of the Outer Pocket to the bottom of the Inner Pocket. Draw a second line 1 ¼ inch to the right of and parallel to this line. Sew along the two marked lines, backstitching at the beginning and end of the seams. 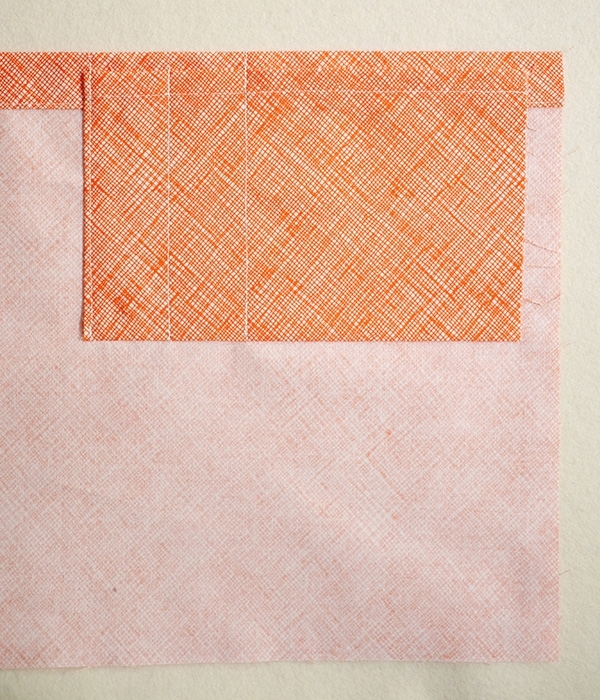 Fold the bottom edge of the Outer Pocket ¼ inch towards the wrong side twice and press. 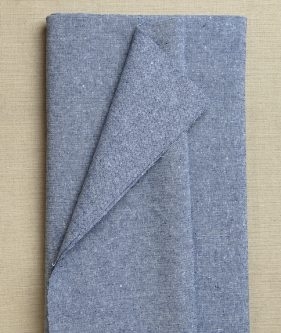 Fold the right side edge of the Outer Pocket ¼ inch towards the wrong side twice and press, encasing the raw edge of the Inner Pocket in this fold. Repeat on the other side edge. Fold the Apron Body in half so that its two short sides meet. Press to create a crease. With its right side facing up, lay the Apron Body out flat. 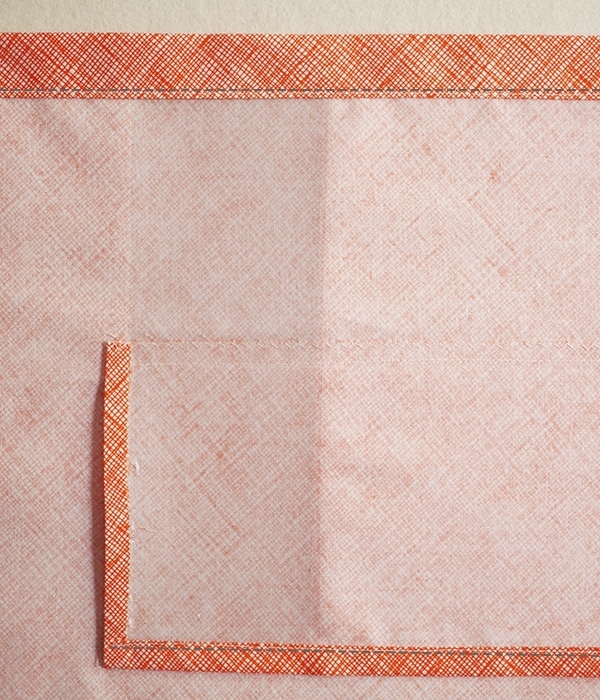 With its right side facing up, place the prepared Pocket on top of the Apron Body so that its top edge runs 5 inches down from and parallel to the top edge of the Apron and its right side runs 3 inches to the right of and parallel to the Apron Body’s center crease. Pin the Pocket to the Apron Body along its side and bottom edges. 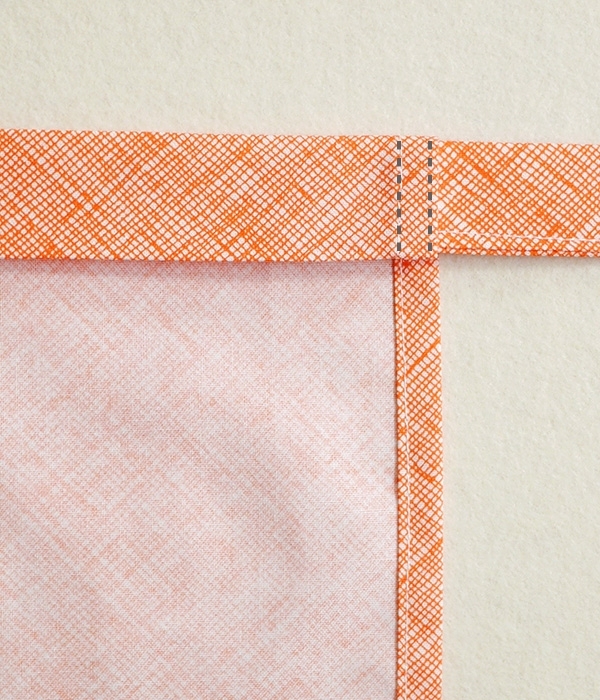 Sew the Pocket to the Apron along the pinned edges with an edgestitch, backstitching at the beginning and end of the seam. 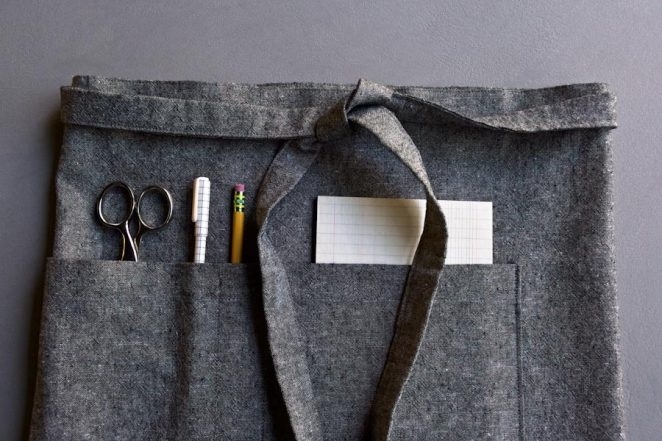 Use the fabric marker and a straight edge to draw a line that runs along the right-most seam of the Inner Pocket and extends down to the bottom edge of the Outer Pocket. 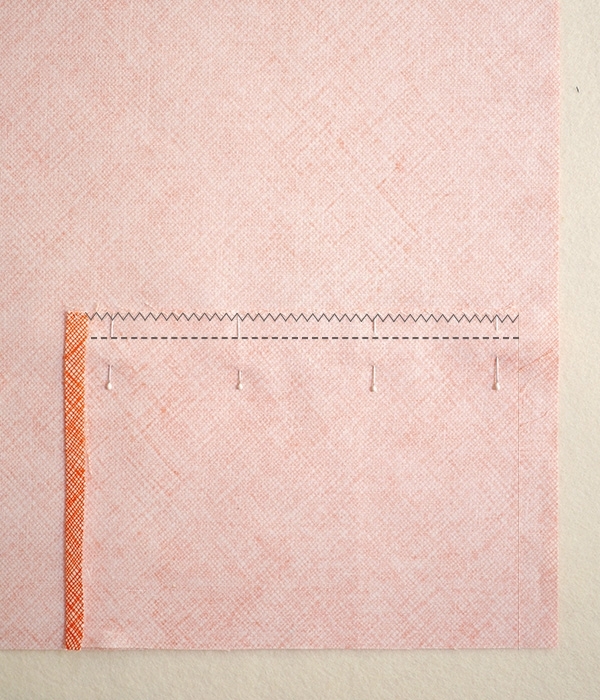 Sew along this line from the top of the Pocket to the bottom, backstitching at the beginning and end of the seam. You’re all done, ready to put your Apron to work! Merci de m’adresser vos mails en français. Love the clean lines, thank you as always for such great patterns and photos. 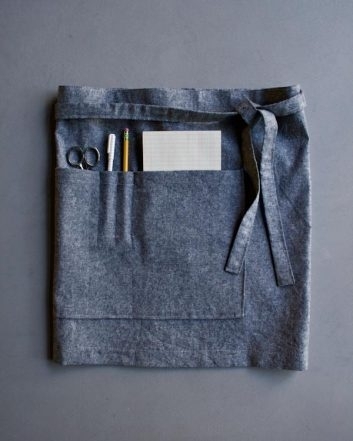 What’s the pen that looks like it has graph paper on it in the apron? I must know! Good spotting on the pen! It’s adorable, isn’t it? Wow, beautiful, so nicely designed, and perfectly shown and explained. Thank you very much, Purl Soho. Wow!! Loved the fabrics and thanks for good tutorial! I looked at the Essex Yarn Dyed fabric and it appears that the Charcoal is darker than the black. Is that accurate? 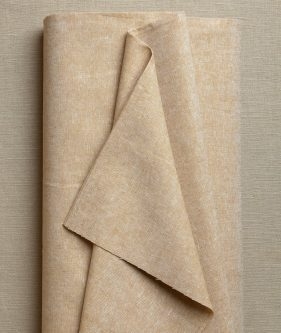 All of the Essex Yarn Dyed fabrics are woven with two different colors for the warp and the weft. The Black fabric is woven with a combination of black and white threads and the Charcoal is woven with a combination of black and grey And, you’re right, the two darker colors together make for a deeper, darker color on the Charcoal fabric. 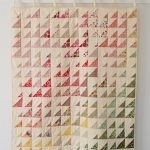 I hope this helps you pick the right fabric for your project. Please let me know if you have any other questions! What’s the purpose of the vinyl? How important is it to include? 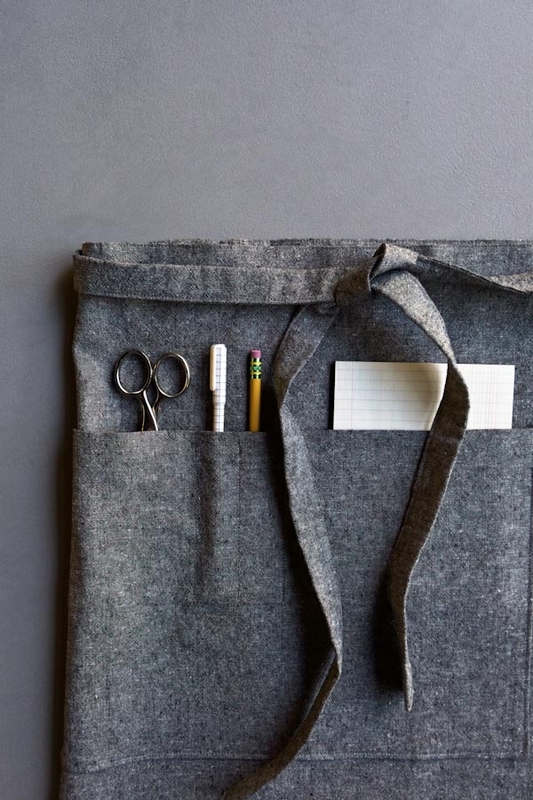 The vinyl is included to protect the fabric from any pen leaks or pencil markings, and also to add an additional layer of thickness for anything sharp or pointed (crochet hooks, scissors, etc.) that you might put in the smaller pockets. It is absolutely not necessary, but can add to the functionality and longevity of the apron depending on how you’ll be using it! I hope this helps! Please let me know if you have any other questions as you work on this project!